I used HEC-HMS to make an uncertainty analysis which generated a uniformly distributed sample of each parameter. And then with each sampled parameter the program ran a simulation and resulted an outflow record. I made 100 realizations and the program resulted a .dss file which contained each record of the outflow and the maximum, minimum and mean outflow. 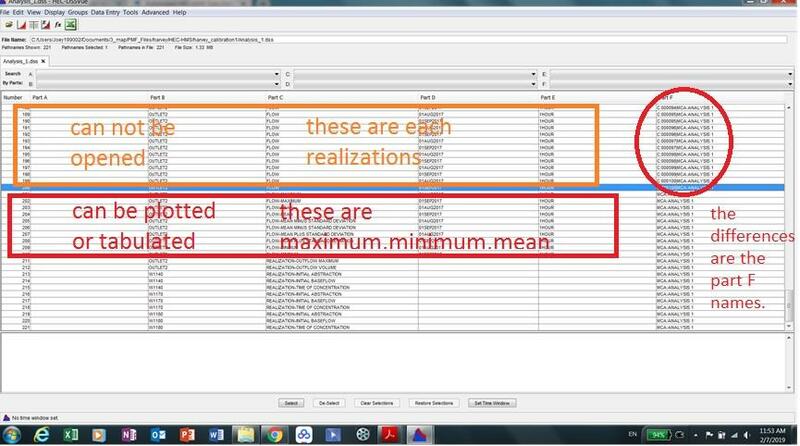 I can open the .dss file with Hec-dssvue and plot or tabulate the maximum, minimum and mean flow records, but i cant plot or tabulate each particular realization record. Every time i tried to edit each realization record HEC-dssvue will pop up a notice saying that there is no data in this record. So, does anyone know how can i get access to these data? Many thanks in advance. Sorry that the attached file is a little blurry.